Congratulations to all the Students - 854 offers from 95 Campus Drives till 22/04/2019. MITS got recognized as Scientific and Industrial Research Organization (SIRO) by Dept. Of Scientific and Industrial Research (DSIR) of DST, Govt. of India, New Delhi. 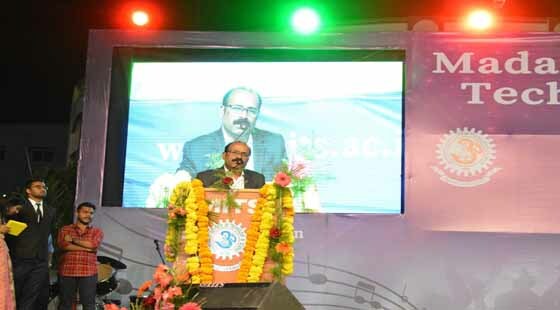 21st Annual Day Celebrations were held at MITS on 18th April 2019. A National Level Students Technical Symposium & Project Expo MECHONANCE-2K19 organized by Department of Mechanical Engineering on 17th April 2019. A One Day National Level Technical Symposium TERA-2K19 organized by Department of Electrical and Electronics Engineering on 16th April 2019. 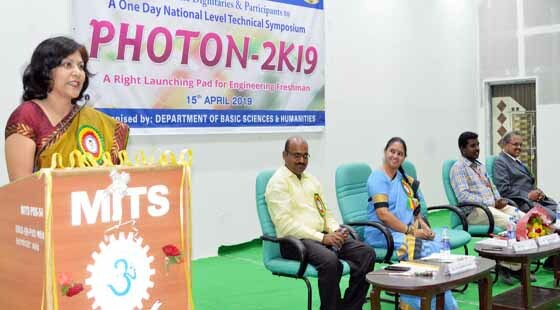 A One Day National Level Technical Symposium PHOTON-2K19 organized by Department of Basic Sciences & Humanities on 15th April 2019. 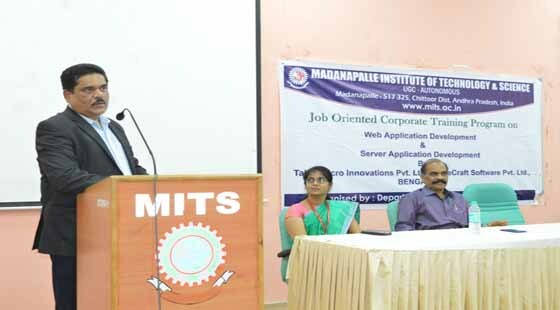 MITS has signed a Memorandum of Understanding (MoU) with Contrivation Labs Pvt. Limited, Bangalore on “Water Harvesting From Atmosphere”. 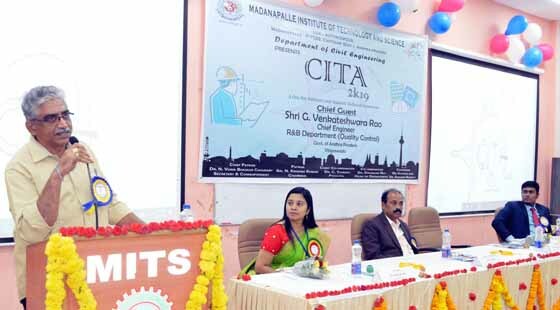 A One Day National Level Students' Technical Symposium CITA - 2K19 was organized by Department of Civil Engineering on 04th April 2019. A One Day National Level Technical Symposium & Project Expo EClectica - 2019 was organised by Department of Electronics & Communication Engineering on 03rd April 2019. 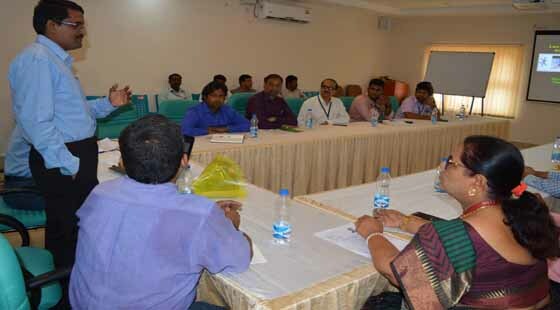 A One Day National Level Technical Symposium GMOCS - 2019 was organised by Department of Computer Science Engineering on 2nd April 2019. 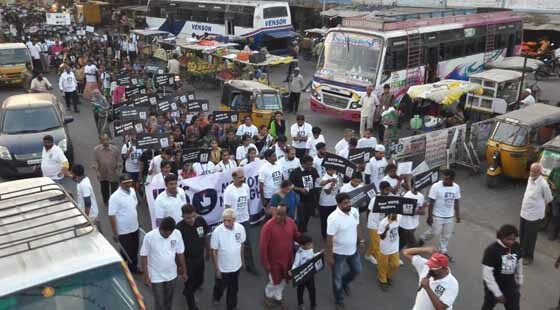 An awareness programme on “Let’s Vote” was organized by MITS on 1st April 2019. 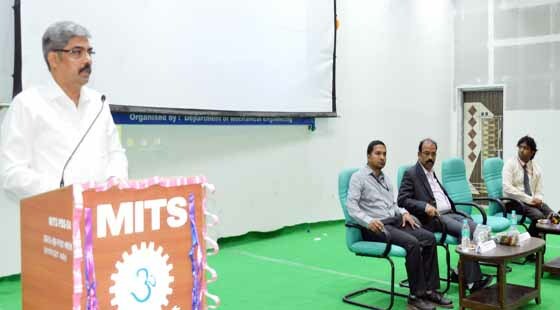 MITS ONLINE MODEL EAMCET 2019 was organized at MITS on 31st March 2019. 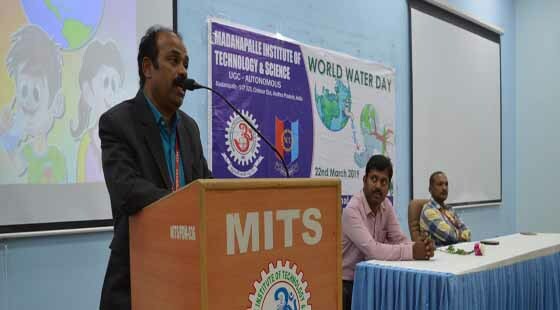 "World Water Day" was organized by MITS - NCC on 22nd March 2019. 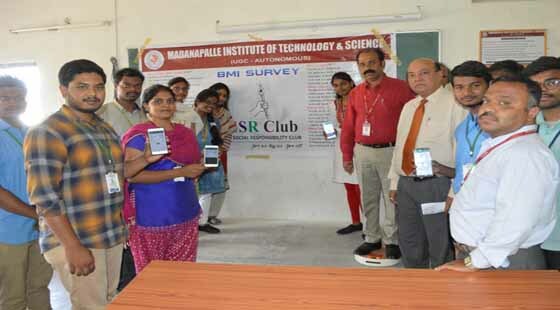 BMI Survey Programme was organized by MITS - MSR Club on 20th March 2019. A Guest Lecture on "Smart Grids" was organized by dept of EEE & MITSAA on 16th March 2019. 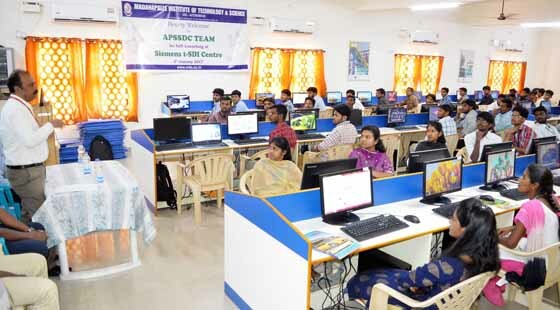 A Guest Lecture on "Embedded Systems principles and Its applications" was organized by Dept. of ECE on 15th March 2019. 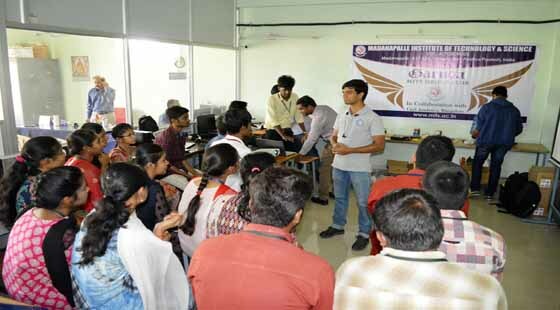 An awareness programme on "Drone Technologies" was organized by "Garuda" MITS Drone Club on 11th March 2019. 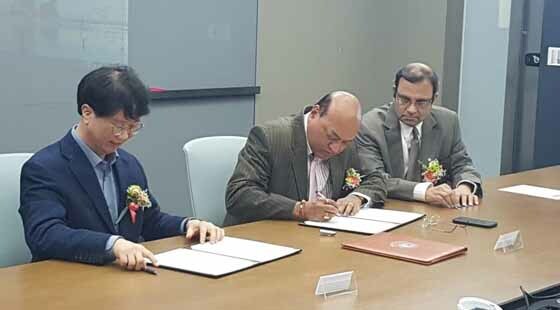 MITS has signed a Memorandum of Understanding (MoU) with National Pingtung University of Science and Technology, Taiwan. 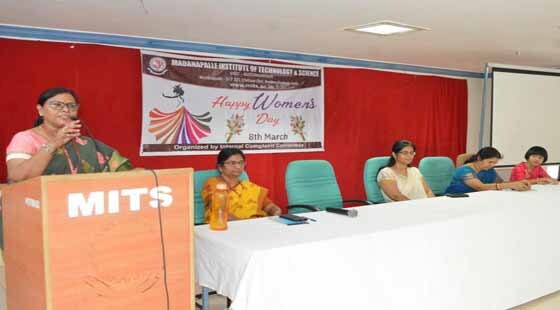 An International Women's Day Celebrations was organized at MITS on 8th March 2019. 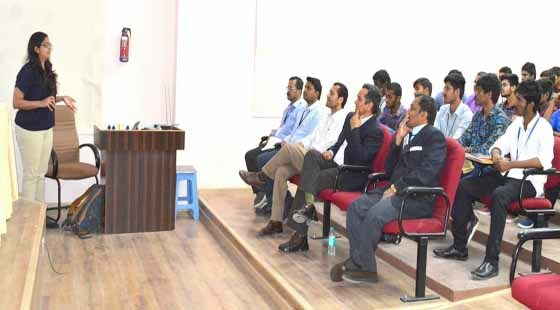 A Guest Lecture on "Corporate Expectation" was organized by Department of MITS School of Business on 7th March 2019. An Awareness programme on "Career & Opportunities in Japan" was organised by Department of English and Foreign Languages & International Cell on 6th March 2019. 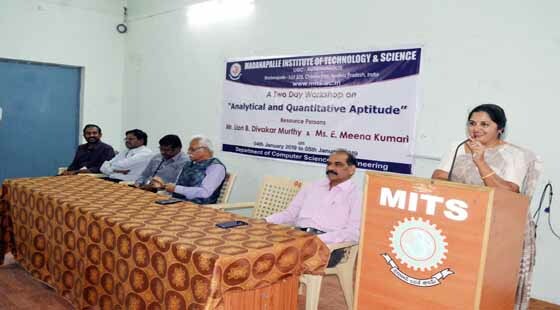 A Guest Lecture on "Data Base : Current & Future Trends" was organised by Department of CSE & MITSAA on 5th March 2019. 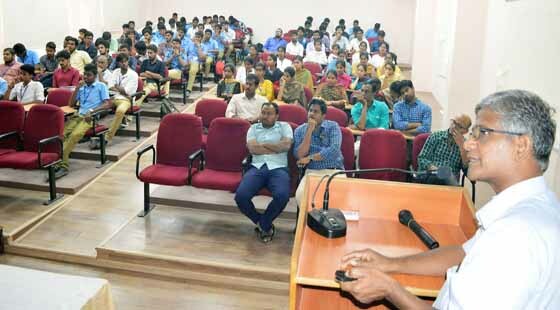 A Guest Lecture on "Role of Engineer in IT-Sector" was organized by Department of Electrical & Electronics Engineering on 2nd March 2019. 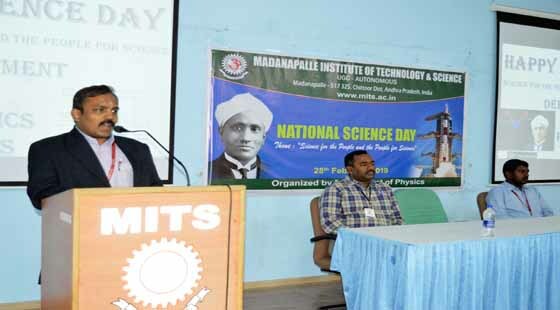 National Science Day was Celebrated at MITS on 28th February 2019. A 5 Days Workshop on ROBO CAD was organized by Department of Mechanical Engineering on 25th February 2019. A Guest Lecture on "Geo-technical Aspects in Ground Improvement" organized by Department of Civil Engineering on 23rd February 2019. 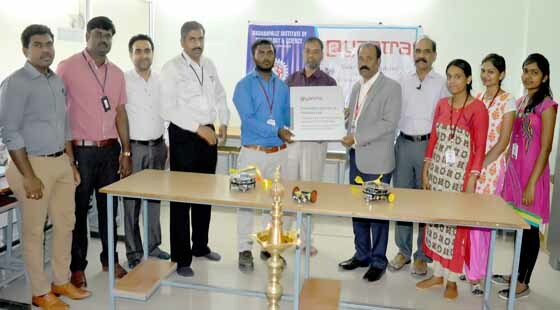 E - Yantra Robotics Lab was inaugurated at MITS on 24th February 2019. 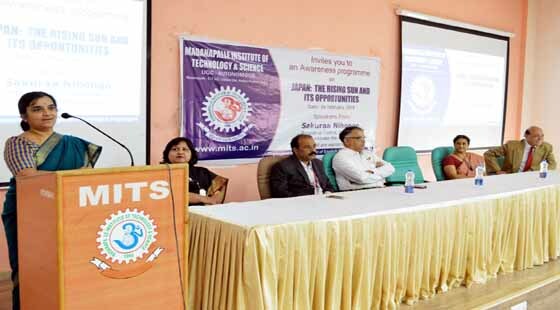 A Guest Lecture on "Opportunities in Machine Tool and Automation Engineering, IoT and Robotics" organised by Dept. of ECE on 22nd February 2019. 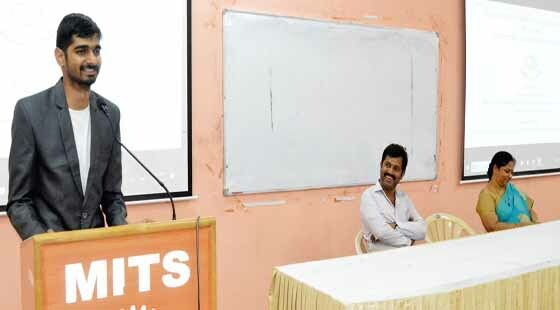 A Guest Lecture on "Sales and Distribution Management" organized by MITS School of Business and MITSAA on 20th February 2019. 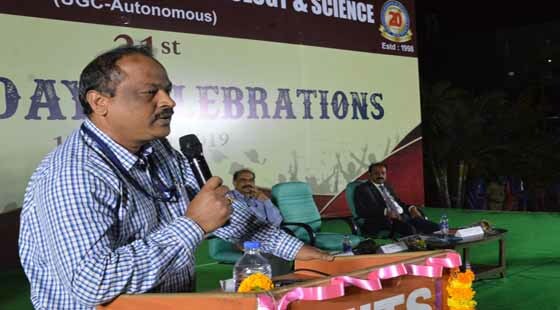 A Two Day National Level Techno Cultural Sports Fest held on 15th & 16th February 2019. An Awareness Programme on “Succeeding at Coding Interviews” organized by Departments of CSE & ECE on 11th February 2019. Dr. Stanley Tseng, Dean International Relations & Professor and Ms. Carol Qiu, Manager - International Relations, National Yunlin University of Science and Technology, Yunlin, Taiwan visited MITS campus on 13th February 2019. 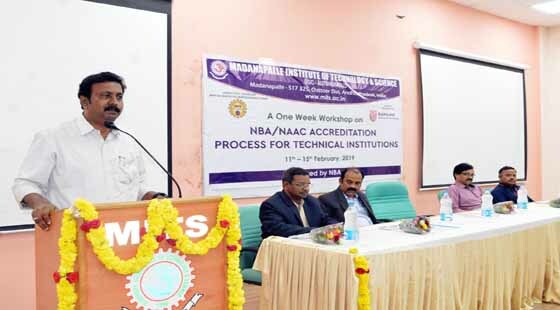 A One Week Workshop on NBA/NAAC Accredition Process for Technical Institutions organized by NBA Cell on 11th February 2019. 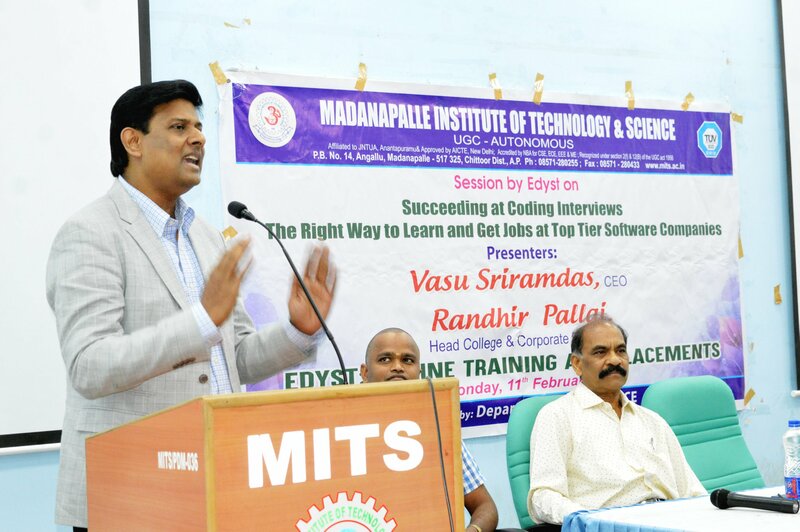 Crescendo 2019 A rayalaseema Graduates' meet organized by Department of Computer Applications & MITS School of Business on 8th February 2019. 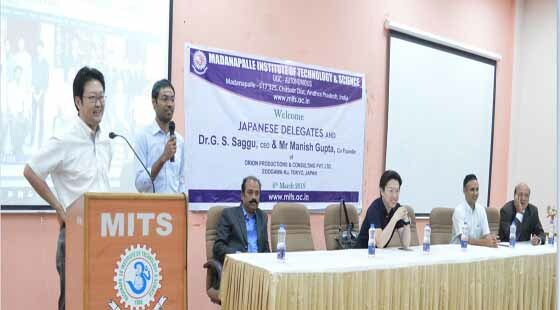 An Awareness programme on Japanese language organized Department of English & Foreign Languages on 6th February 2019. A Guest Lecture on "Career Guidance after Engineering" organized by was organized by EEE Department in association with MITSAWA and ISTE on 2nd February 2019. MITS has signed a Memorandum of Understanding (MoU) with Kookmin University, South Korea a leading University in Korea. A Guest Lecture on "Challenges in Signal and Power Integrity for Server Design" organized by Department of Electronics and Communication Engineering on 2nd February 2019. 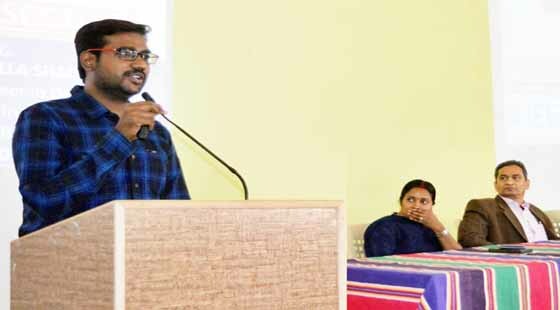 An Interaction session with Dr. Eswar Sunkara, Space Science Laboratory, Department of Astronomy and Space Science, Chungnam National University (CNU), Daejeon 305-764, Korea on 29th January 2019. A Guest Lecture on "Career Opportunities in Indian Armed Forces as Officer" with the association of Cavalier India Bangalore, organised by NCC on 28th January 2019. Republic Day celebrations were held at MITS on 26th January 2019. 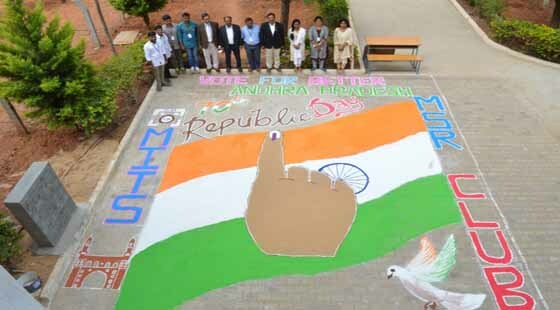 National Voters' Day was organized by NSS on 25th January 2019. 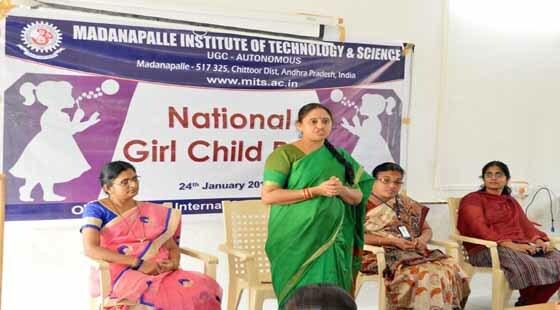 National Girl Child Day was organized by ICC on 24th January 2019. A Guest Lecture on "IT Trends" to B.Tech - CSE III Year Students organized by MITSAA on 19th January 2019. A Job Oriented Corporate Training Programme on Web Application & Server Application Development organized by Department of Computer Applications on 18th January 2019. 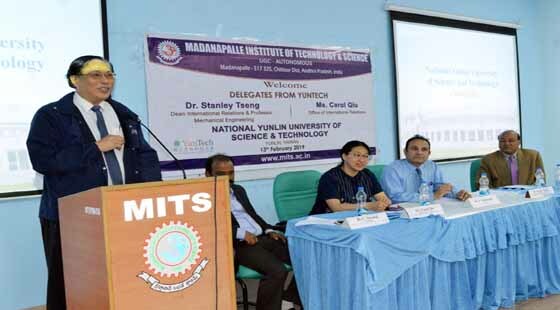 A Guest Lecture on "Research Scope in Mechanical Engineering" was organized by Dept. of Mech & MITSAA on 17th January 2019. 155th Birth Anniversary of Swami Vivekananda was organized by NCC & NSS on 12th January 2019. A Guest lecture on Career Guidance by MITS Alumni was organized by MITSAA on 10th January 2019. 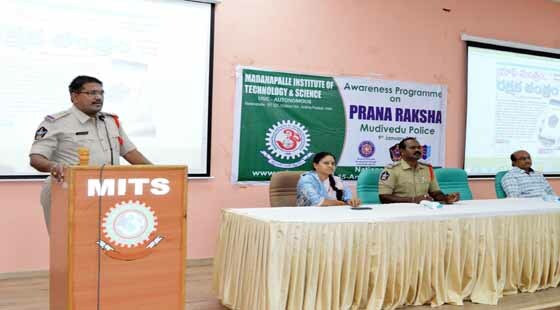 An Awareness Programme on Prana Raksha Application by Mudivedu Police was organised by MITS on 9th January 2019. A Two Day Workshop on "Analytical and Quantitative Aptitude" organized by Department of Computer Science & Engineering on 4th & 5th January 2019. 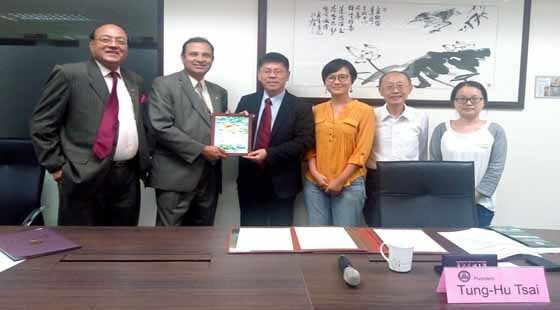 MITS to Collaborate with National United University, Miaoli for Academic & Research Excellence. "NYPUNYA-2K18" A True Hands on Experience for Diploma Students was organized at MITS on 29th December 2018. A Three Day Workshop on "Design and Development of E-Mobility Vehicles" organized by Department of Mechanical Engineering during 21-23 December 2018. 1st Graduation Day Celebrations was organized at MITS on 22nd December 2018. A Guest Lecture on Condition Assessment & Non Destruction Testing of Concrete: Basics, Importance and Methods was organized by Dept. of Civil on 20th December 2018. Interaction Session with Prof. Soo Hyun Park - President and Prof. Soo Young Shin- Vice President of Special Communication Research Centre, Kookmin University, South Korea held on 18th & 19th December 2018. The "World Energy Conservation Day" was organized by Department of Electrical & Electronics Engineering on 14th December 2018. A Guest Lecture on "Innovative Ideas on new Technologies" organized by Dept of Computer Applications for MCA Students on 13th December 2018. 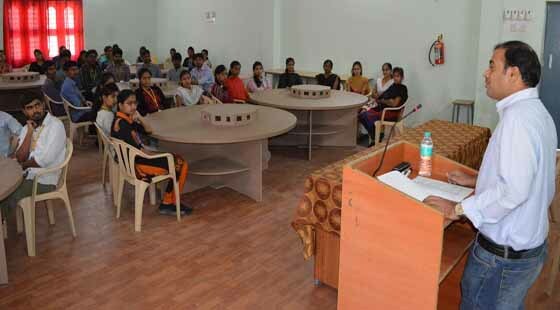 An Awareness Programme on “PRE Engineering buildings” was organized by the Dept. of Civil at MITS on 5th December 2018. A Two Day National level workshop on Outcome Based Learning in NBA/NAAC Evaluation on 30th Nov & 1st Dec 2018. World Aids Day Awareness Rally was organized by NSS & NCC Cells on 1st December 2018. MITS signed MoU with Providence University, Taiwan for Academic & Research Excellence. 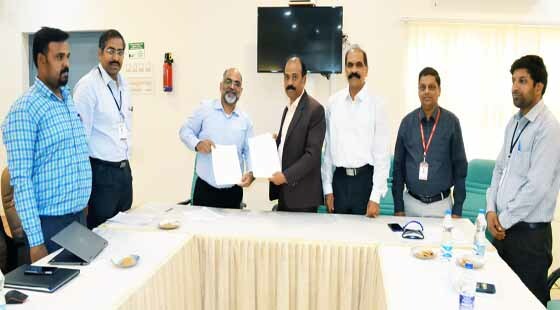 MITS has signed an MoU with GC German Center for Engineering and Management Studies UG Aachen and European Center for Mechatronics and Manufacturing (ECMM) APS GmbH Aachen Germany. MITS achieved AAA rating for the fourth time by NPTEL on 17th July 2018. 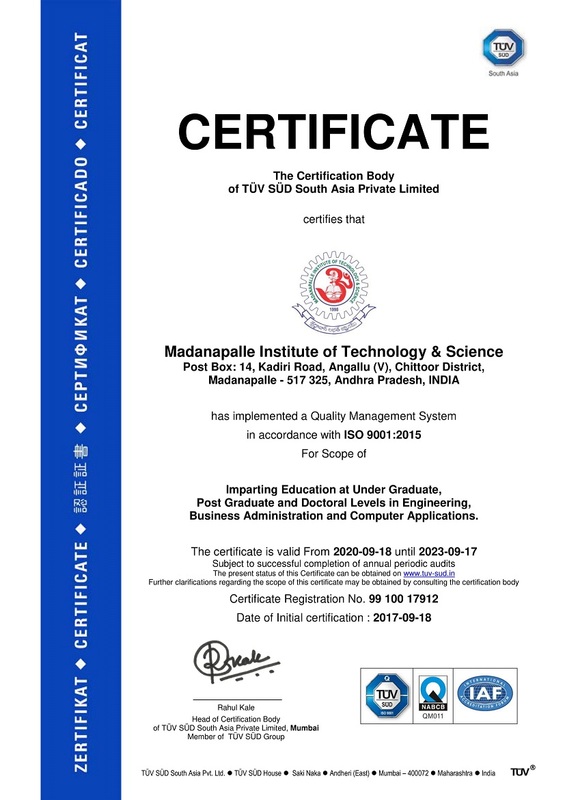 MITS MoU with Smart Bridge Education Service Pvt Ltd., Hyderabad 10th July 2018. Stanford University Innovation Fellows Success meet held at Vijayawada on 30th April 2018. A Two Day National Level Techno Cultural Sports Fest held on 16th & 17th February 2018. Dewang Mehta National Education Awards “Education Leadership Award” was presented to MITS at 25th Business School Affairs organized by Institute of Public Enterprise in Hyderabad on 29/01/2017. Madanapalle Institute of Technology & Science received the "Outstanding Engineering Institute - South award", as part of the National Education Awards 2016. MITS Secured 1st Position among 2212 local chapters with 'AAA' rating by National Programme on Technology Enhanced Learning (NPTEL) based on the performance in NPTEL Online Courses during the period July-October 2018. MITS gets 'AAA' rating by National Programme on Technology Enhanced Learning (NPTEL) based on the performance in NPTEL Online Courses during the period Jan-June 2018. Dear Student Congratulations, MITS Academic and Extra & Co-Curricular Excellence Awards was presented during Annual Day Celebration on 20th April 2018. Ms.V.Anusha from MCA Department, Congratulated on her Success of winning JNTUA Prathibha Award 2017. MITS Academic and Extra & Co-Curricular Excellence Awards presented during Annual Day Celebration on 20th April 2017. MITS received Rs.10,00,000/- grant from Ministry of Skill Development & Entrepreneurship under Pradhan Mantri Yuva Yojana (Udyamita). The Departments of CSE, ECE, EEE, ME & Management studies are categorized as "GOLD" by AICTE - CII SURVEY OF INDUSTRY - LINKED TECHNICAL INSTITUTES - 2015. Congratulations.... Mr. Meda Anvesh - ME - III Year for IIT, Gauwahati, Mr. Arshad Shaik - EEE - II Year for IISc, Bengaluru, Mr. B. Venkata Viswanath - CSE - II Year for NARL, Tirupati were selected for Summer Research Fellowship Programme – 2017. Congratulations.... Mr. Y. M. Vijaya Sudarsan from Electrical and Electronics Engineering Department is Congratulated on his Success of winning JNTUA Prathibha Award 2016. Congratulations.... Ms.N.Bharathi (11691A0306) of Mechanical Engg Dept & Mr.A.M.Siva Krishna (11691A1240) of IT Dept are Congratulated on their Success for being awarded "GOLD MEDAL" for Academic Excellence of the batch 2011-2015 by JNTU, Anantapur. Congratulations.... Ms.N.Bharathi (11691A0306) of Mechanical Engg Dept, Ms.K.Shakeela (13691D8722) of Mechanical Engg Dept & Mr.A.M.SIVA KRISHNA (11691A1240) of IT Dept are Congratulated on their Success of winning JNTUA Prathibha Awards 2015. Congratulations.... Ms.C.S.Soumya Sree (10691A0326) of Mechanical Engg Dept, has Congratulated on her Success for being awarded "GOLD MEDAL" for Academic Excellence of the batch 2010-2014 by JNTU, Anantapur. Congratulations.... Mr.T.Nagabhushanam Reddy (08691A0318) of Mechanical Engg Dept, has Congratulated on his Success for being awarded "GOLD MEDAL" for Academic Excellence of the batch 2008-2012 by JNTU, Anantapur. Admitted students for Ph.D. Programme will be paid Rs.18,000/ p.m. for Engineering disciplines and Rs.10,000/p.m. for Management discipline up to a period of three years. The University Grants Commission (UGC) has released PG professional fellowship grants to six students Mr.Y.Rohitha, Mr.M.Vinay Kumar, Mr.C.Rajesh, Mr.D.Lakshminarayana, Ms.A.Jyothi and Ms.D.Nirosha of MBA. MITS, originated under the auspices of Ratakonda Ranga Reddy Educational Academy under the proactive leadership of Sri. N. Krishna Kumar M.S. (U.S.A), President and Dr. N. Vijaya Bhaskar Choudary, Ph.D., Secretary & Correspondent of the Academy. 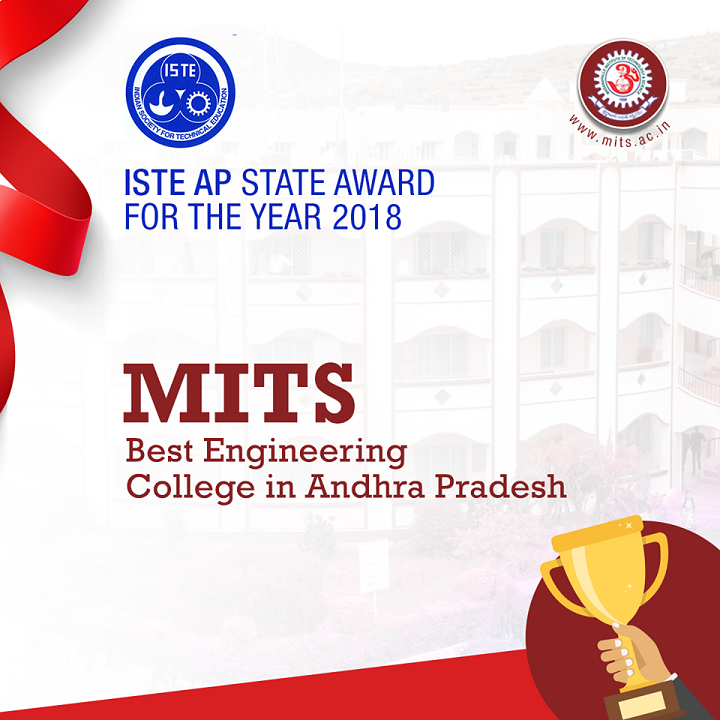 MITS is governed by a progressive management that never rests on laurels and has been striving conscientiously to develop it as one of the best centers of Academic Excellence in India. The Institution's profile is firmly based on strategies and action plans that match changing demands of the nation and the students fraternity.MITS enjoys constant support and patronage of NRI's with distinguished academic traditions and vast experience in Engineering & Technology. IDEA COMPETITION, organized by MITS Innovation Society in association with MHRD, Last date for submitting abstract is 5th April 2019. A One Day National Level Students' Technical Symposium & Project Expo MECHONANCE - 2K19 was organized by Department of Mechanical Engineering on 17th April 2019. 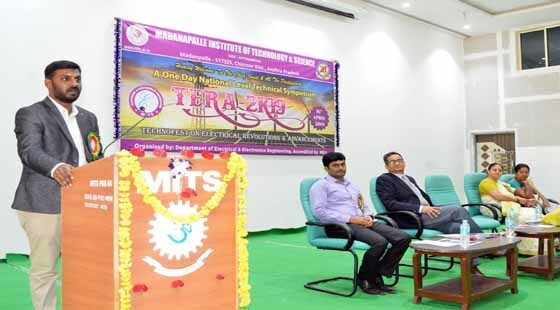 A One Day National Level Technical Symposium Technofest on Electrical Revolutions and Advancements TERA - 2K19 was organized by Department of Electrical and Electronics Engineering on 16th April 2019. A One Day National Level Technical Symposium PHOTON'19 was organized by Department of Basic Sciences & Humanities on 15th April 2019. A One Day National Level Technical Symposium & Project Expo EClectica - 2019 was organized by Department of Electronics & Communication Engineering on 03rd April 2019. 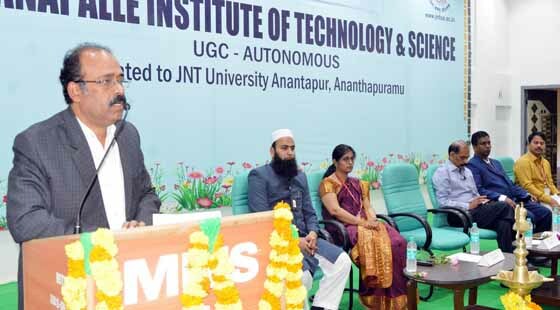 A One Day National Level Technical Symposium GMOCS - 2019 was organized by Department of Computer Science Engineering on 02nd April 2019. The Joint International Conference on ICAIECES - 2017 & ICPCIT - 2017 organized at MITS during 27th, 28th & 29th April 2017. Smart India Hackathon 2019 - A Grand Opportunity for all Technology Students.The last date for submission of Ideas is 23rd January 2019. Techno Cultural Sports Fest on 16th & 17th February 2018. Techno Cultural Sports Fest held on 22nd & 23rd February 2017.